The Power Search is located at the top of every page and lets you search specific fields such as Agent Name, Contact Name, the More Info field, and more. Other search options are available on certain pages as described in this article. The Power Search is located at the top of every page. 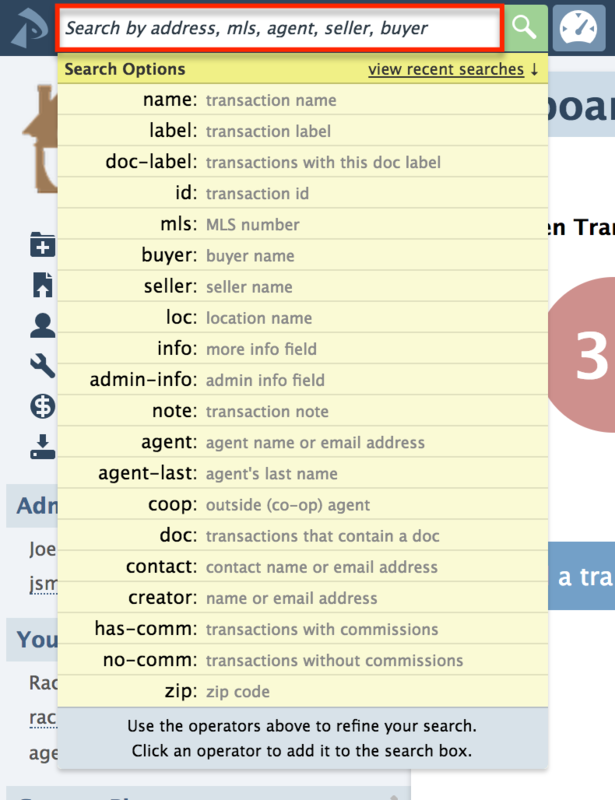 The search field will automatically search Agent, MLS, buyer, and seller fields. To search in one of those fields, enter your search criteria then click the [Search] icon or Enter on your keyboard. Click inside the search box to activate your options. To search in a different field, use the search options that appear below the search box when you click in it. For example, to search in the Contact field, select [Contact] then enter part of a contact's last name or email address. To access inactive transactions (e.g., closed, fell through or expired, use the search and filter options described below. Use the search to run a broad search. This will search the address, MLS, agent, seller, and buyer fields. Enter all or part of the search term you'd like to search into the search area. Click the green [Search] icon to search. The matching transactions will be displayed in the resulting list. Use Advanced Search to specify one or more of the criteria you'd like to search. Click [Advanced Search] to expand the Advanced Search area. Select or enter your desired search criteria. Click [Search Transactions]. The matching transactions will be displayed in the resulting list. Click [Search]. The results will be displayed in the resulting list. Click [Filter]. The results will be sorted by the field you specified. Select the field on which you would like to sort. The results will be displayed in the resulting list. Use your web browser's inherent search capability to quickly find text on a page. From a PC hold down the CTRL key then tap the F key. Or from a Mac hold down the CTRL key then tap the F key. Enter all or part of the search term. Your search term will be highlighted wherever it appears on the page. Use the ENTER key on your keyboard or the arrows within the search area to advance to each matching instance. This session covers both the standard and creative methods of finding what you need in Pipeline. This Pipeline Pro webinar covers building custom reports that pull the exact transactions you need to see. The Advanced Search area allows you to combine search and filter criteria for all the primary transaction fields, including date fields, saving you time by manually excluding unneeded transactions.